Trail Information: 1 mile, easy. The trail begins at an allée of century-old hybrid sycamore trees, moves up the hill past newly planted American chestnuts and loops a meandering mile down through a meadow. Forty-eight poems feature the work of poets from fourteen countries and cultures. The common thread is the poet’s close read of some aspect of the natural world. The Scott and Hella McVay Poetry Trail speaks to the symbiotic relationship between art and nature. 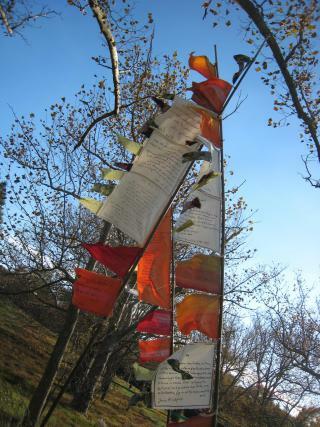 Click here: http://drgreenway.org/walks.htm#PoetryTrail and scroll down the page to see the on-site documentary Transplanted Trees by David Kelly Crow. The documentary follows Native American poet, storyteller, and author Joseph Bruchac as he leads a group of Princeton area residents, poetry aficionados, and nature lovers along the Scott and Hella McVay Poetry Trail. Bruchac and several other area poets and writers, including Jim Haba, Penny Harter and Nupur Lahiri read poems aloud, accompanied by a Native American flute played by Bruchac's son, Jesse. History: In autumn 2010, the Scott and Hella McVay Poetry Trail was dedicated in Greenway Meadows Park. The trail was inspired and designed by Scott and Hella McVay in partnership with D&R Greenway. Directions: From Route 206, turn on Elm Road and take a left on Rosedale Rd. Preservation Place will be on your left- look for the D&R Greenway sign. Parking is available at the Johnson Education Center and at Greenway Meadows, ~500 feet further down Rosedale on your left. From Greenway Meadows, walk up the path, past the playground and soccer fields. From the Johnson Education Center, walk behind the building towards Greenway Meadows. Look for an allée of large hybrid Sycamore trees to start exploring the Poetry Trail.